The IG04 BACnet Gateway is a protocol gateway between a Vaisala WXT520/530 Weather Transmitter or WMT52/WXT532 Ultrasonic Wind Sensor and a BACnet network. The IG04 interrogates the Vaisala device and stores the current values for all NMEA data points. This data is updated and transmitted regularly as predefined BACnet Objects available as BACnet/IP or BACnet MS/TP values. Once the Vaisala transmitter is configured and connected to the IG04, they will commence communicating. 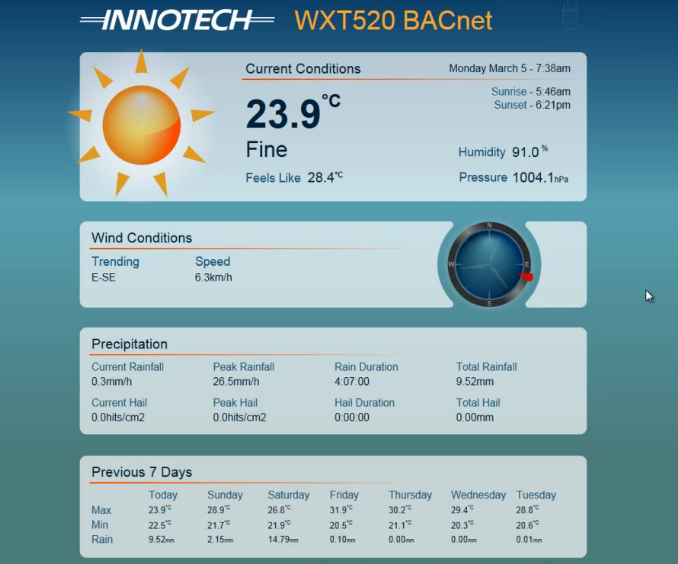 The weather data can then be viewed directly from the embedded weather page on the IG04. The BACnet Objects are also available for integration into your BMS project. Since its release, the IG04 has become the preferred integration solution in the HVAC/BMS markets globally. Continued enhancements of the IG04 BACnet Gateway have not only produced a simplified integration solution, but a solution for any client requiring complete multi-user, web-based Weather Station technology.